One of the greatest benefits of Social Media to HR is Social Recruiting, which has revived the recruitment practices globally. Working in HR for quite good years, I have closely witnessed the change that recruitment has undergone in the recent times. Unlike traditional recruiting days (just a couple of years to be precise), recruiters are no more the over-worked genre of HR professionals, social media has given them a competitive edge. There has never been a better time for recruitment than now but the new age of social hiring is set to replace the traditional recruitment model. The popular tweet from Lars Schmidt “Everyone is a Brand Ambassador , Everyone is a recruiter” is appropriate to today’s hiring practices. With more and more organizations and HR professionals embracing the Social Networking Technology, we have a larger than before breed of hiring experts. The responsibility to recruit talent is shifting from recruitment professionals to employees, thanks to social recruiting tools like Branchout, Glassdoor , Vine etc . If the trend continues, our headhunting specialists will be soon replaced by the new age strategic recruiters. The traditional resume is no more sufficient to reflect candidate’s potential, Klout and LinkedIn are doing it better. 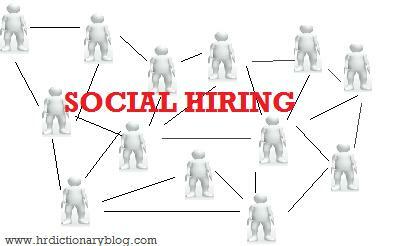 Social media and linkedIn are the preferred choice for job seekers as well as employers. These social resumes are considered more relevant profiles as they are constantly updated and have active recommendations. Though traditional resume has not become obsolete, it has transformed from a one page static document to a versatile online social media profile. Social media has given employees an access to large pool of referrals competing for common position. More referrals means more profiles to screen, more e-mails to respond and more applicants to interact with. To accommodate the fast changing scenario, companies will need more specialized software to keep track of employee referrals.